Lowest draw weight for first bow? Discussion in 'Primitive Tools' started by petrifiedwood, Sep 10, 2010. I'm considering ordering a take-down recurve bow, and I'd like some suggestions. I haven't loosed an arrow in decades, and even then it was with toy fiberglass bows and cheap throw away arrows. I want to get a bow that will be powerful enough to ethically kill small to medium sized game, but light enough to learn on. I'm pretty sure I want to stay around 35# or under. If I decide I want to start bow hunting deer sized game, I'd probably get a more powerful (but compound) bow. For now, the simplicity of a more traditional bow without cams and pulleys all over the place is attractive to me, but the lack of a "let off" would be a big problem for me since my muscles aren't used to pulling a bowstring back. So, what would be a good starting draw weight to get for a casual shooter to learn on? Also, can you recommend any inexpensive take down bows that are available in the draw weight you think is best? Well the ontario hunting regulations say you need a 40# bow at 28 inches I don't know if that helps. i love the natural beauty and simplicity of a nice traditional and/or primitive bow..
it is very important in the early/begining stages or shooting trad. bows, that you allow your body to get to used to shooting and build muscle memory... devoloping a solid anchor point is key.. the anchor point is where u bring the arrow/string back to your face, it should be the same spot every time... most folks tend to over-bow themselves right away and in turn their form is all over the place..
out of all of the bows i own(8 trad. bows), the bow that i shoot the most is a sweet little 58 in. brush-bow, that pulls 47#'s @ 28 in.. i love it.. it was made by a Ca. bowyer/friend Steve Abbott..
check out www.3riversarchery.com and/or www.kustomkingarchery.com both places should have plenty of gear and bows for you to look over..
good luck and feel free to drop me a line if you have anymore questions.. Thanks, this helps quite a bit. It's reassuring to know that going with a lighter weight at first is sound practice. I'm not too old, but I'm old enough to know my limitations. I might even consider going as low as 25# to get started. But I worry that it would severely limit the bow's utility beyond just a training tool. Also, as Abe Elias posted above, I am aware there are minimum hunting weights in some areas (though I'm not sure about my area since I hadn't really considered bowhunting before now). I guess I'll have to look up the hunting regs and see what the minimum is, then decide if I'm going to want to learn on a bow of that weight, or go lighter with the expectation that I would have to buy a second bow if I decide to hunt with it. Ok, I edited this post to add that my state has a minimum of 40# draw (or peak, for compounds). I think I might eventually have to buy a second bow if I want to hunt with it. But, this at least makes it easier to look at buying a real lightweight to learn on. 25# is pretty light. My 10 year old daughter shoots a 20# bow. Unless you have a health issue, I'd recommend starting with the 40#. I tend towards lighter bows myself, having tendonitis problems in my arms and problems with my upper back, and my hunting bows are 40#. Yeah I love traditional looking bows. I really don't like the way these high tech bows look. I'm wanting to make my own soon. I just bought a hand plainer. Now I need the right wood. Great advice! The beauty of a take-down bow is you can usually get different weight limbs for the riser. A light weight set for getting your form down, and step up to hunting weight. The feel of the bow, the sight picture, rest, etc., don't vary, and the transition is almost seamless. That IS one of the advantages of a compound bow: you can vary the pull weight. I'm an advocate of learning form on a 'self-bow' (long or recurve). A compound covers up a lot of sloppy shooting, but it doesn't turn a poor shooter into a good one. Like MJH said, you'll need two sets of shafts for the different draw weights. I guess the best thing would be to go to an archery shop and try various pulls until I found a suitable one. Good plan! More to the point of your OP: I draw a 52# hunting recurve. When I got into competition, I went bare-bow with a 35# recurve. Did very well. Form and follow through is everything, and you can't concentrate on that if you're straining against the pull weight. Some guys take pride in bragging about the weight of their bow, but remember the First Nation hunters took bison with a 35# flat bow! For starters, I woud suggest between 35-40# to get the muscle memory and skill. It also depends on the bow. In my experience some bows draw smoother than others of the same weight. If you can, try out as many different types (longbow, recurve, laminated, self) and brands possible. 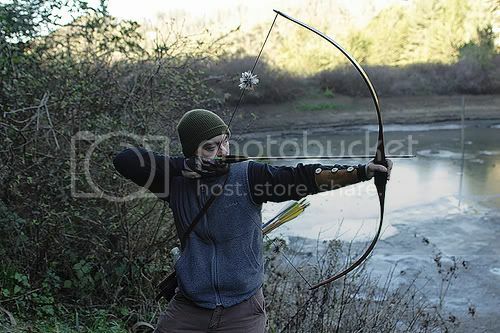 I give a +1 to 3 Rivers Archery as referenced above. I have been to their shop several times. Their customer service is second to none.